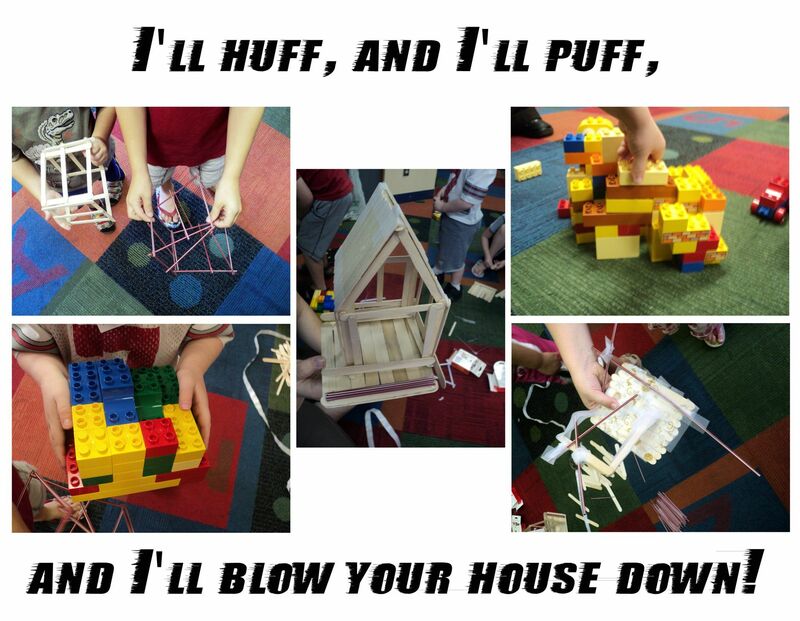 Brief Description: Help the three little pigs build a house that won’t blow down! Retelling of the Three Little Pigs. Ask the children if they know the story of the Three Little Pigs. Have each child help to tell the tale. 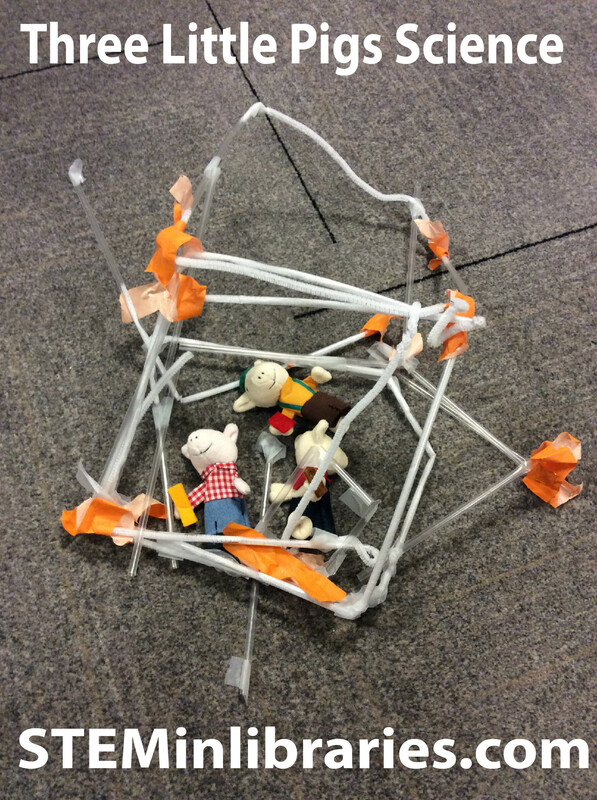 We divided the children into groups, and together they worked on designs that they thought would withstand strong winds (provided by a powerful fan). We borrowed a large, powerful fan to be our Big Bad Wolf. 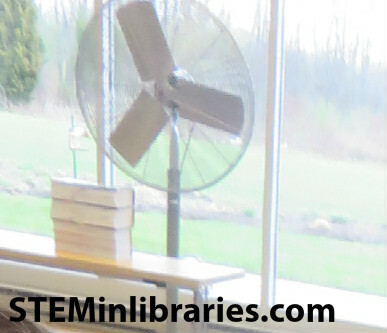 The fan was one typically used in a server room to keep the machines cool, so it was very large and very powerful. 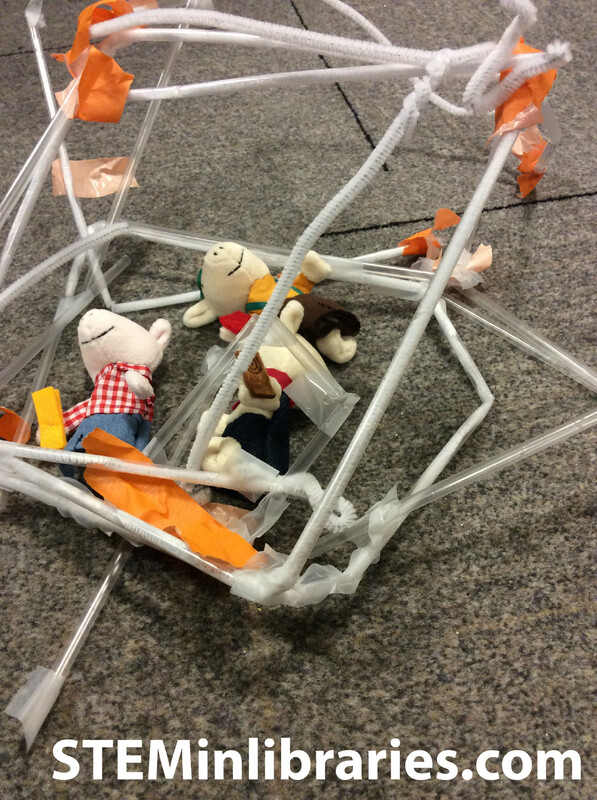 When the children completed their structures, they would bring them to a table set in front of the fan, placed a Little Piggie puppet inside the new house, and, all together, would chant “I’ll huff, and I’ll puff, and I’ll blow your house down!” before the fan would be turned on. We would then observe if the house stood, blew off the table, or fell apart. Children would then make adjustments to their houses and try again, until we moved on to the next activity. This program was inspired by an image found on Pinterest. This program went amazingly well, and the children were absolutely delighted with it. There are only two adaptations we would consider for future programs. The first would be to add a second large fan, if possible. The fan we used, while powerful, wasn’t powerful enough to move the Lego houses, and some of the popsicle houses, too. The second change would be to have the program last longer than an hour. The children had so much fun building their houses, testing them, and refining them, that by the time we got to the Lego houses, they hardly had any time left to build them. This program would work well for an older, tween audience (grades 4-6). 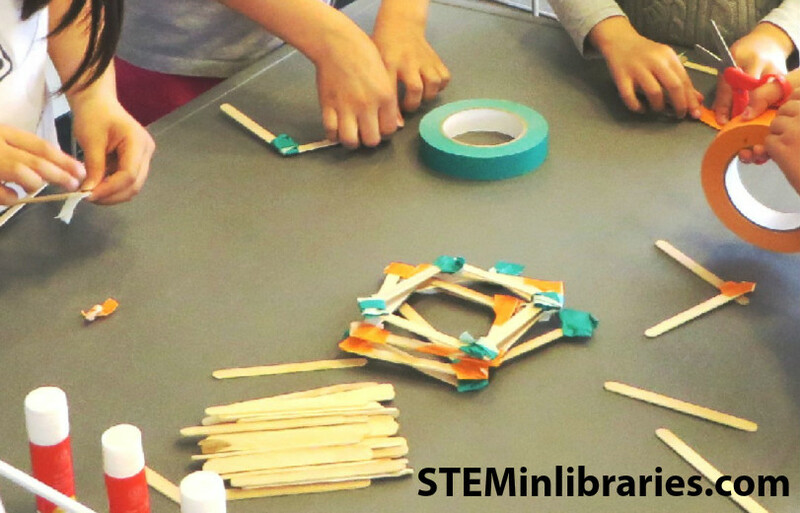 They might find the Three Little Pigs aspect to be a bit childish, and that angle could be dropped, but the overall concept of building houses out of different materials, and then testing their wind strength is immensely appealing. If more complex materials were presented, this would even work well for a teen audience. Building, and better yet, destroying structures is something that has a far ranging appeal. This program would work well for a younger audience, if it was presented as a family program. 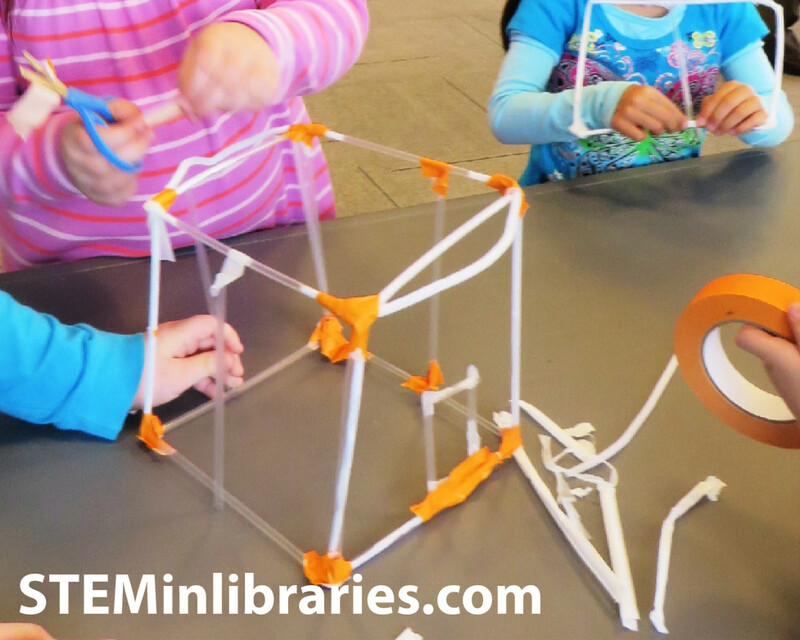 Children younger than first grade might have difficulty building structures by themselves, and would be greatly aided in being assisted by an adult. They certainly would enjoy the “I’ll huff, and I’ll puff, and I’ll blow your house down!” part. « Week Twenty-Six : Radical Robots!